Lyme disease is caused by spiral-shaped bacteria called Borrelia burgdorferi (found in the U.S.) and Borrelia afzelii (found in Europe). Two different species of ticks, Ixodes scapularis and Ixodes pacificus, transmit the bacteria to humans via bites. 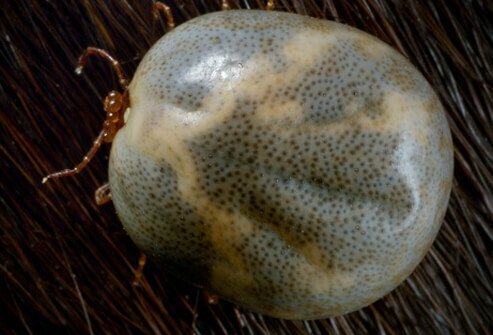 Some ticks carried by deer transmit the bacteria that cause Lyme disease. Lyme disease is not contagious from person to person. Lyme disease can affect many areas of the body including the heart, skin, joints, and nervous system. Lyme disease came to light in 1975 when children living in the community of Lyme, Connecticut became afflicted with what was at first thought to be rheumatoid arthritis. The disease was named after the town where these children lived. Researchers eventually identified the bacteria that caused the illness in 1982. 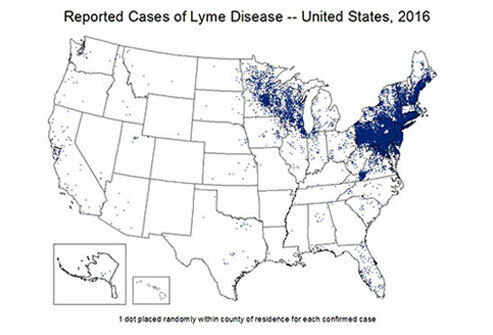 Lyme disease is present in all 50 states, but the illness is most commonly found in the Northeastern part of the U.S. Lyme disease is prevalent in areas with a high population of ticks, especially ticks infected with the Lyme disease bacteria. More than 50% of ticks in New York State carry the bacteria that cause Lyme disease. The illness has been reported all over the world including Australia, China, Europe, Japan, and in countries that were once part of the Soviet Union. What are the symptoms and signs of Lyme disease? There are three distinct phases of Lyme disease. 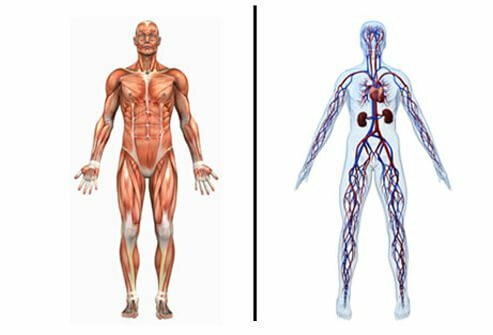 Each phase involves different parts of the body. 1. Early localized disease causes skin rashes and redness. 2. 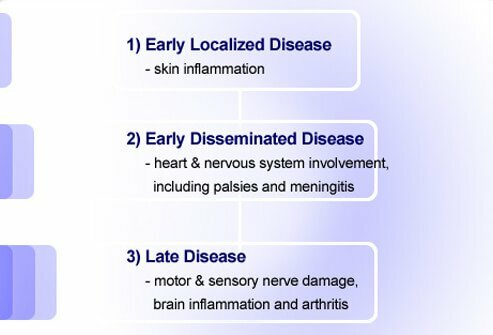 Early disseminated disease affects the nervous system and heart. People in this stage may have palsies that cause paralysis and tremors. A rare but potentially life-threatening bacterial infection called meningitis may occur in this stage. Meningitis affects the tissue surrounding the brain and spinal cord (meninges). 3. Late disease involves arthritis and neurological issues. During this stage damage to nerves of sensation and movement can occur. 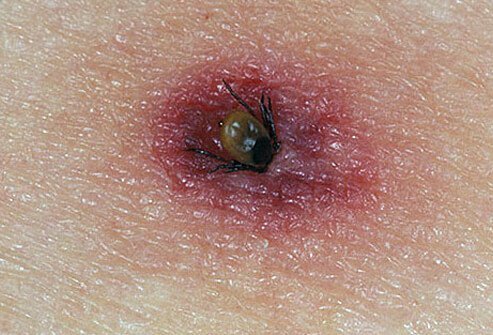 A characteristic flat, red ring or bull's-eye rash develops in 75% of those who have been bitten by a tick infected with Lyme disease. The rash appears days to weeks after the bite and spreads outward. The bull's-eye rash is called "erythema migrans." Some people don't notice or remember being bitten by a tick either because the tick was too small or a rash never appeared. Someone with newly acquired Lyme disease may suffer from fatigue, headache, joint and muscle stiffness, and swollen glands. Later stages of the disease affect the heart, joints, and nervous system. Untreated, skin redness associated with early localized Lyme disease resolves in about one month. The second stage occurs weeks or months after the appearance of the red rash. During this time, bacteria affect other parts of the body including the heart, joints, and nervous system. Late-stage Lyme disease can inflame the heart and lead to heart rhythm disorders and even heart failure. Nervous system problems associated with late disease may include facial paralysis (Bell's palsy), meningitis, confusion, and abnormal function of the nerves outside of the spinal cord (peripheral neuropathy). Joint inflammation can occur -- typically in just one to a few joints (often the knees) -- resulting in pain, stiffness, and swelling. Arthritis associated with Lyme disease can become chronic and may mimic other forms of inflammatory arthritis. Doctors use a variety of methods to diagnose Lyme disease. Different approaches may be used depending on the stage of the disease. Early Lyme disease is easily diagnosed if a person has the characteristic red, bull's-eye rash. The diagnosis is considered when a person has recently been in an area known to have ticks that harbor the bacteria. Sometimes the diagnosis is not as clear-cut. The doctor may perform a physical exam and order tests to exclude other potential problems with the heart, joints, and nervous system. Antibody tests are available for Lyme disease, but they are not useful in the early stage. They are more helpful in the diagnosis of later stages. A test called the ELISA assay is used to detect Lyme disease antibodies. However, there's a possibility of a false positive diagnosis because Lyme disease antibodies may be present in the body for years after the illness has resolved. The most reliable test available to confirm the diagnosis of Lyme disease is called the Western Blot assay. Antibiotics can cure Lyme disease. 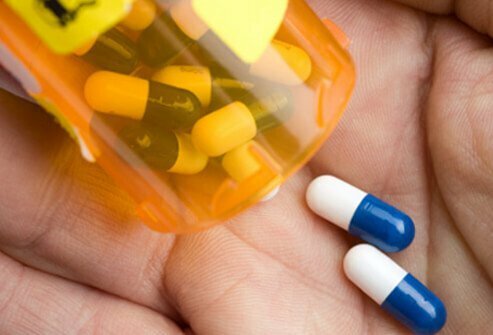 Different stages of disease may be treated with different antibiotics. Treatment choices also depend on the areas of the body involved. Oral amoxicillin (Amoxil), cefuroxime axetil (Ceftin), and doxycycline (Vibramycin) are often used to treat the early stages of Lyme disease. A bull's-eye skin rash after a tick bite is a reason to see the doctor urgently for treatment. The rash typically resolves in about 1 or 2 weeks with antibiotic treatment. Intravenous medications such as ceftriaxone (Rocephin) may be necessary to treat later stages of Lyme disease. What's the treatment for later-stage joint pain of Lyme disease? There are a few options to treat the joint pain and swelling associated with Lyme disease. Pain-relievers and anti-inflammatories – such as ibuprofen (Motrin, Nuprin) – can help relieve symptoms. 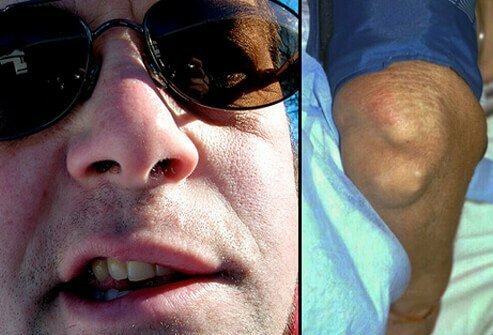 An in-office procedure called arthrocentesis can be used to withdraw fluid from swollen joints. Rarely, arthritis persists after antibiotic treatment. Some scientists believe that chronic joint inflammation can be triggered by the infection even after the successful elimination of Lyme bacteria. The best way to avoid Lyme disease is to prevent it! Take the following measures to reduce the risk of a tick bites and illness. Wear shirts with long sleeves and pants to protect the skin. Apply bug repellant containing DEET to exposed areas. 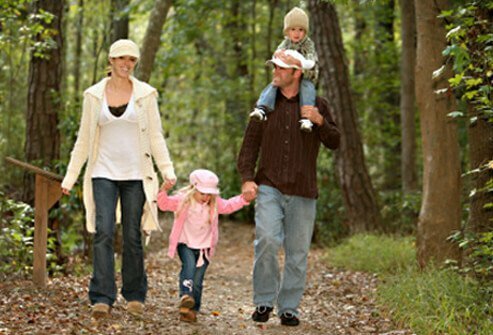 Examine clothing, kids, and pets for ticks after excursions to areas known to harbor ticks. If a tick bites, use tweezers to remove it from the skin. Place the tick in a closed container and provide it to health professionals for identification. Remove clothes and bathe -- washing the entire body and scalp -- to help prevent tick bites and the transmission of Lyme disease. 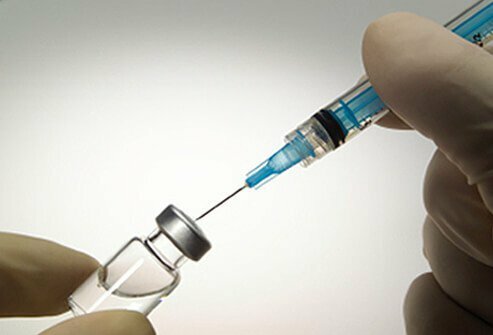 Currently, there is no vaccine available to prevent Lyme disease. The LYMErixTM Lyme disease vaccine was withdrawn from the market in 2002. More vaccine research is needed. Prevention is the best weapon against Lyme disease. © 2007 Interactive Medical Media LLC. All rights reserved. Image reprinted with permission from eMedicine.com, 2008. Centers for Disease Control and Prevention: "Lyme Disease." Centers for Disease Control and Prevention: "Lyme Disease Diagnosis and Testing." Centers for Disease Control and Prevention: "Lyme Disease: What You Need to Know." Centers for Disease Control and Prevention: "Lyme Disease Transmission." Centers for Disease Control and Prevention: "Lyme Disease Treatment." Centers for Disease Control and Prevention: "Preventing Tick Bites." Centers for Disease Control and Prevention: "Signs and Symptoms of Lyme Disease." Todar’s Textbook of Online Bacteriology: "Borrelia burgdorferi and Lyme Disease." UpToDate: Hu, L., et al. "Patient Information - Lyme Disease Treatment (Beyond the Basics)."